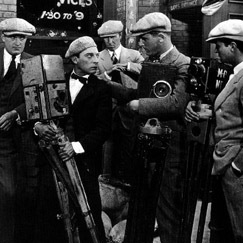 Official directorial credits for films starring Buster Keaton are not given in this article; see the Great Directors entry on Keaton for a full filmography. Buster Keaton’s two-reeler My Wife’s Relations (1922) is prefaced by an intertitle which reads: “In the foreign section of a big city – where so many different languages are spoken, the people misunderstand each other perfectly…” Following this, alternate montage connects two utterly disconnected situations. In the first situation, Keaton, playing a sculptor, vigorously absorbed by the demands of his work, accidentally collides with a postman. In the second situation, a couple “speaking” Polish call a celebrant on the telephone to ask if he is available to marry them forthwith. In the first situation, Keaton’s collision with the postman has two outcomes, both of which drive the narrative on. Keaton is left with a letter whose addressee is encrypted in the smudged details on the envelope, and the postman throws something at Keaton which, like the letter, misses its destination, and breaks the window of a neighbouring building – the building, no less, where the celebrant of the second situation awaits his clients. Keaton’s attempt to flee the scene of the crime is obstructed by a big fat burly beast of a woman who has witnessed the flying projectile, assumed Keaton to have been responsible for it and marched him in to face the wrath of the owner of the property. Because the celebrant doesn’t speak English, he in turn assumes they are the couple desperate to make their vows and marries them accordingly. Keaton’s new wife takes him home to her father and brothers, all of who mistreat him terribly. His would be the lot of an overworked “Cinderfella” had the father not found the misappropriated letter, opened it, read of an inheritance and assumed the beneficiary to be his son-in-law. Accordingly, the family reverses its treatment of him and all, together, begin to live the life of Riley. That is, until the family of the letter’s real addressee determines to revenge itself upon those who have taken what does not belong to them. In My Wife’s Relations, the play of contingency and misinterpretation provides the means by which Keaton (the director) connects disconnected events. What he dubs the perfection of misunderstanding in his hands becomes both an admirable description of the film’s comicality and the basis of narrative structure. In Cinema 1: The Movement-Image, Gilles Deleuze describes this connective aspect of Keaton’s aesthetic in terms of the recursion function (1). The English edition of Cinema 1 translates fonctions récurrentes and series récurrentes (2) as recurrent function and recurrent series respectively but this leads to an unusual characterisation of Keaton’s gags and doesn’t, in any case, fit with the analogy that Deleuze draws between Keaton’s cinema and Rube Goldberg’s cartoons. When spoiled cat (A) discovers he is alone, he lets out a yell which scares mouse (B) into jumping in the basket (C), causing lever end (D) to rise and pull string (E) which snaps automatic cigar lighter (F). Flame (G) starts fire sprinkler (H). Water runs on dishes (I) and drips into sink (J). Turtle (K), thinking he hears babbling brook babbling, and having no sense of direction, starts wrong way and pulls string (L), which turns on switch (M) that starts electric glow heater (N). Heat ray dries the dishes. Another example of a recursion trajectory, perhaps the most elemental to be found in Keaton’s films, occurs in another two-reeler, The Pale Face. The Keaton character’s effort to flee the clutches of the Indians is stymied when the chase manoeuvres him toward the edge of a ravine. Its precipices are connected by a broken-down bridge, consisting of two parallel ropes and less than a handful of planks, which provide a path for the distance of only one or two steps. Beyond this, the ropes are bare, and the bridge hollows out to the abyss below. Keaton has no means of escaping the Indians except by this forsaken bridge, so he installs himself as a machine in it, removes a plank from behind him as he crosses it and replaces it in front of him, thereby continuing his trajectory in a repetitive and piecemeal fashion. 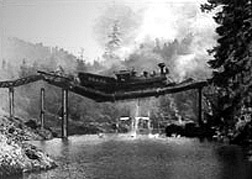 The two sides of the ravine thus present the points of disconnection, and the planks of wood, individually useless, are the elements of the series that provide Keaton’s means of transportation. The planks, in other words, are his props. While Deleuze himself is loathe to specify the role of the comic performer or the comedic in the discussions of cinematic comedy in either of his Cinema books (5), this essay explores the connection between the aesthetic that he identifies as specifically Keatonesque and the humorous quality of Keaton’s narratives. Keaton’s unique formulation and utilisation of the action-image is taken as a means of constructing cinematic narrative in accordance with Deleuze’s own conception of narrative as something not given in the cinema but “a consequence of the visible [apparent] images themselves and their direct combinations” (6). Keaton’s utilisation of the recursion function, the current essay argues, generates non-dialectical and inorganic teleologies. Recursion is thus the comic means by which Keaton discloses the machine lying at the heart of narrative. The argument presented here extends the recent theorisation of cinematic comedy by Steve Neale and Frank Krutnik in their book Popular Film and Television Comedy (7) and by Tom Gunning in his essay on the operational aesthetic entitled “Crazy Machines in the Garden of Forking Paths: Mischief Gags and the Origins of American Film Comedy” (8). It focuses upon the aesthetic implications of Neale and Krutnik’s contention that the shift in the industrial basis of cinema that saw the demand for longer films necessitated greater emphasis upon narrative in ’20s slapstick. It considers Gunning’s identification of the operational aesthetic with the causal structure of the machine and with gag-based comedy. By explicating and interpreting Deleuze’s treatment of Keaton’s singular deployment of the action-image, it gives concrete content to Gunning’s claim that this coincidence between the machine and the gag lays bare the mechanics of narrative articulation. It thereby investigates further Keaton’s comic configurations of mise-en-scène, gags and narrative structures in order to assess their significance for our understanding of narrative in general. Keaton’s two-reelers look back to Mack Sennett’s aesthetics in their slapstick and chase sequences, in the emergence of comedy from the interpenetration of situations which are parallel in space and time although wildly disparate in content, and in their experimentation with dream logic, particularly the imbrication of comic logic and dream logic. But the two-reelers also look forward to his features in their emphasis on props and in their construction of both stories and gags around the deployment of props. Indeed, the finest of the features are stories built around a single prop – the train in The General, the ocean liner in The Navigator, the steamboat in Steamboat Bill, Jr., the cinema in Sherlock, Jr., and the movie camera in The Cameraman – or a motif, which is in any case a concept that has a prop-like status – athletics in College and marriage in Seven Chances. By Keaton’s own admission, his short films were often not much more than a compilation of improvised gags, sometimes with less than the barest bones of narrative structure. But such extemporising, he observed, could not sustain a 100-minute film (9). And although he shares the credits with other directors in his shorts as well as his features, Keaton himself has quite tellingly suggested that in his feature films other directors were largely brought in to assist with the development of a storyline (10). The question that concerns me here is how the need for a story-line, for narrative, forced Keaton, beyond seeking assistance from other directors, to relearn his comic repertoire between making short and feature-length films. To put it another way: to what extent did Keaton in fact subordinate the comic to narrative, or vice versa? The subordination of the comic to narrative, or of the possibility of the comic replacing logical causality with surprise, fate, chance, luck, etc., or of slapstick existing as a non-narrative kind of cinematic attraction are the most vehemently debated questions by theorists of cinematic comedy. David Bordwell, Steve Neale, Frank Krutnik, Donald Crafton, Tom Gunning, and Henry Jenkins (11) have all attempted in one way or another to account for the relationship between the comic and narrative. In approaching this issue here, I will argue that what comes to distinguish Keaton’s transition from the two-reeler to the feature-length film is that his gags are not so much recast within the dramatic form of narrative as mobilised in such a way as to create a distinctive form of comedy (12) . In order to show how Keaton’s gags provide him with a structuring logic for his extended narratives, let me first very briefly provide details of the kinds of narrative that are found in his two-reelers. The preponderance of adventures and situations furnishes the “structure” of Keaton’s short films with a more or less rudimentary narrative form. The films tend to chronicle the Keaton character’s life rather than present fully formulated narratives. The narratives vary, however, in the degree to which they are linear and in the extent to which they are digressive or resolved, and in the way events are organised according to the rules of psychological and causal motivation. For the most part they are largely produced through building up humorous incidents or episodes; they are not properly structured interpretations of events, but formations that emerge as a result of nothing more than the continuity of time and space. Four kinds of narrative can be identified in the two-reelers, although it is not necessarily the case that they are mutually exclusive. A consideration of the articulation of these narratives will in turn enable us to understand how, in addition to the external pressures associated with the demand for longer films that were brought to bear on his filmmaking, Keaton eventually arrived at a distinctive form of cinematic narrative. The two-reelers of the first group are conventional in the sense of being goal-oriented, psychologically motivated, structured through the logic of causality and resolved at the end. These quest narratives detail the Keaton character’s attempt to achieve a goal (whether it is marriage (Neighbors; Day Dreams; Cops  or the completion (successful or unsuccessful) of any kind of task (One Week ; The Electric House ). While these narratives are quite conventional, they are also farcical in as much as the narrative is rudimentary while the plot is as voluminous as its events are inconsequential. Those of the second group are less structured by narrative flow than built around situations, much like the situation comedies that we see on television. Keaton retains this kind of structure from the time he worked with Arbuckle. It is evident in such films as Coney Island (1917), The Butcher Boy (1917) and The Garage (1919) (all made with Arbuckle) and continues to predominate in The Playhouse (1921), The Blacksmith (1922), The Scarecrow (1920), The Haunted House (1921) and My Wife’s Relations. The third group – The Boat (1921), The Balloonatic (1923), The High Sign (1921), Hard Luck (1921), The Goat (1921), The Pale Face (1921) – are adventure narratives with digressive trajectories brought about by comic processes. The Keaton character’s narrative agency in these films is minimised – meaning that he does not so much set out on an adventure (in the way he does later in the feature film Go West  for example), as embody the attributes of a nearly will-less man caught up in the flotsam and jetsam of the world at large, but doing his best to adapt to the ordeals that it presents to him. This characteristic provides for the digressive structure of such films and allows the comic free reign. The films of the fourth group, structured according to the “logic” of displacement, are without a rational basis for connecting events. In The Frozen North (1922), The Love Nest (1923) and Convict 13 (1920), even the most tenuous narrative logic of coincidence and accident is abandoned and replaced by dream logic. Causality is more dramatically forsaken in Convict 13 and The Frozen North than in The Love Nest. It was in the features, however, that the problem of the tension between narrative and the comic presented itself most emphatically to Keaton. There is evidence to suggest that because the demand for a story was at odds with the methods he had previously developed for making audiences laugh, Keaton’s shift to making feature-length comedies led him to reconsider the comic possibilities at his disposal. In his biography he outlines how the need for a stronger storyline meant that between his two-reelers and features he had to relinquish implausible narrative structures and impossible gags. He had to curb his use of slapstick and work on developing believable characters. He also had to avoid gags that were discontinuous with the basic plot structure (13). Narrative linearity presented one of the biggest difficulties. Keaton learned through experience that in feature-length films audiences would not tolerate having their attention diverted from the hero’s efforts to resolve the problems presented by the narrative. 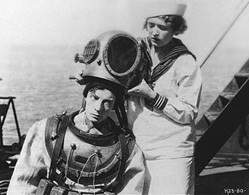 To illustrate the point, he cites one of his favorite sight-gags, devised for The Navigator (1924). It was to take place in the scene where Keaton, having donned a diving suit, plunges down to the bottom of the ocean to mend a leak in the ship on which he and the girl have been set adrift. At his disposal he has a number of gags relating to the incongruity of situation and behaviour (while underwater he puts up a barricade bearing the sign “Men at Work” and washes his hands in a bucket of water) and also to the transformation of objects (he uses a lobster as a pair of pliers and a swordfish as a weapon to joust with another swordfish). All of these gags, according to Keaton, were readily accepted by the audience. The one they rejected (and which was cut from the film) involved the Keaton character playing the part of traffic cop. Pinning a starfish to his diver’s suit, he held up his hand to halt a passing school of fish so that a big fish waiting patiently for clear passage could go along its way. When the gag was shown in the trailer, the audience’s response was suitably mirthful, indicating that the gag itself was not lacking in comicality. But a subsequent test-screening of the whole film revealed that its placement in the narrative vitiated its comic potential. Keaton concluded that his “feature comedies would succeed best when the audience took the plot seriously enough to root for [him]” as he “indomitably worked [his]…way out of mounting perils” (14). The challenge then was to devise a way of making gags while retaining a narrative structure that would guarantee the maintenance of audience attention. While Keaton’s feature films were more conventional in narrative structure than his two-reelers – not only more teleological but also more organised around the Keaton character as agent of narrative development – an examination of his first forays into feature filmmaking indicates that it wasn’t a straightforward transition. His first feature, The Three Ages, a parody of D.W. Griffith’s Intolerance (1916), is in fact three short films intercut with each other, each exploring the same theme but in different epochs – love in prehistoric, Roman, and modern times. The feature-length narrative of his next film, Our Hospitality, was achieved largely by subordinating comedy to melodrama. The beginning of the film is firmly organised by the melodramatic mode; the narrative hinging upon a feud between two families which provides the situation for a duel between the Keaton character and the brothers of his love interest. Comedy is injected into the duel structure; it breaks with conventional melodramatic realism, but its effects are comparatively insignificant in terms of narrative development, leading David Bordwell et al to cite it for its exemplary narrative structure in spite of its genre (15). The third feature, Sherlock, Jr., confirms that Keaton was even at that stage still uncomfortable with the full-length narrative. This time he deals with the problem by inserting a dream within a film within the film, which allows him to retain the impossible gags and divergent logical structures of some of his earlier films. It is only with his fourth feature, The Navigator, that Keaton makes the transition to full feature-length comedic narrative. It is noteworthy that in this film he interweaves the narrative structure with a prop in a manner that he had not done so resolutely since One Week. Both The Navigator and The General attest to a comparatively greater ease with narrative structure on Keaton’s part and the story is implicated in nearly all of the incidents related. In The Navigator, Keaton plays a card-carrying member of the idle rich, Rollo Treadway. The plot of the film at its broadest level involves Rollo attempting to get the girl he loves to marry him. While she initially rejects him, complication and coincidence, which sees them both set adrift on an ocean liner called “the Navigator”, conspire to give them a second chance. Un-navigated, as it were, they are subjected to the will and whim of the elements. In the course of their adventure, Rollo and the girl must adapt to the scale of the ship, hazard fierce storms and vast seas and fend off a tribe of hungry cannibals. A series of individual tests brings them closer together until the final shot where their embrace affirms their love for each other. Conventional narrative causality also appears to organise the unfolding of events in The General. The film presents the story of the heroic deeds of a Southern patriot in the American Civil War. Keaton plays an esteemed train driver called Johnnie who has but two loves, his engine, eponymously named The General, and a girl called Annabelle. When Civil War engulfs the South, Annabelle’s brother and father do the honourable thing and enlist. Annabelle expects Johnnie to do the same, but when he tries his application is refused because he is regarded as more valuable as a train driver. Annabelle dismisses Johnnie’s excuses and vows to have nothing to do with him until he is in uniform. From this point on, the narrative concerns Johnnie’s redemption. Even though in both films all the events in some way pertain either to developing the character for the audience or to the films’ narrative unfolding, there is nevertheless a sense in which these feature-length narratives differ from their non-comedic counterparts. Chance, fate, luck, and coincidence are more significant factors in the orchestration of these films’ narratives. For example, just when it becomes clear that the test of “navigation” in The Navigator has overwhelmed the protagonists and death by drowning is inevitable, a submarine – the deus ex machina – comes to the rescue. And in The General, coincidence is the only reason that Annabelle journeys on Johnnie’s train to visit her wounded father in a nearby town and it is bad fortune that she remains on board when it is stolen by the Northerners. When Johnnie makes it his mission to retrieve his beloved train, it is unknown to him that Annabelle has been taken hostage and it is pure luck that he is privy to Northerners’ battle plans. Coincidence, not heroism, nor any dialectical capability on Johnnie’s part, enables him to rescue both Annabelle and his train and warn the Confederates of the pending Yankee offensive. Coincidence and chance undermine the functions that causality and character agency have in narrative. In particular, such factors erase the way that conventional rational causality produces narrative meaning and, indeed, legitimates narrative’s claim to meaning. On the other hand, this is not to suggest that coincidence and chance necessarily make the films non-narrative or anti-narrative. One of the most interesting arguments that can be brought to bear on the relationship between comedy and narrative structure in early cinema comes from Tom Gunning’s theorisation of an operational aesthetic based on demonstrating the function of the machine. Whereas theorists like David Bordwell and Steve Neale and Frank Krutnik generally concur that in the relationship between narrative and the comic the abandonment of causal motivation is more or less a generic convention (16), Gunning, by contrast, actually makes mechanical causality the crux of the relationship between cinematic comedy and the operational aesthetic (17). The operational aesthetic, similarly bound up with the nineteenth century context of cinema, extends Gunning’s previous theorisation of the cinema of attractions (18). Gunning uses the latter concept to account for cinema’s emergence from the specific cultural and technological conditions of the nineteenth century, noting in particular the vast array of optical toys and visual attractions that both culminated in the invention of cinema and established its audience as sophisticated urban pleasure seekers. The imperative of early cinema or the cinema of attractions was not, he argues, to tell stories so much as to arouse and to intensify the curiosity of its audience, to astonish and shock them. The earliest evidence of the operational aesthetic is found in the audience’s attraction to the cinematograph itself; the films screened by the cinematograph are deemed by Gunning to be “simply a demonstration of the machine’s process and functioning” (19). This cinematographic machine similarly captured the process and functioning of other machines as we see in the Lumière brothers’ 1896 actualité, Arrival of the Train. The fascination with the machine went hand in hand with cinema’s illusory capacity. Gunning cites, for example, early cinema’s appropriation of the music hall’s sausage machine routine where a pig is herded into one end of a box and comes out the other side as meat cuts and sausages (20). The operational aesthetic also revelled in the reversibility of nature, as is illustrated by the brothers’ film of the brick wall that is erected and dismantled by manipulating the forward and reverse wind mechanism of the projector. While many of the cinematic examples of the fascination with operationality have a comic element to them, it was in the plethora of mischief films produced over the years 1896–1905 that cinematic comedy really got underway. It is in them that narrative, gag and mechanism became three distinctive means of ordering the temporal process in a way that was distinctively cinematic. Gunning identifies these three components of the operational aesthetic in his analysis of L’Arroseur arrosé (1895), a film often cited as the first piece of cinematic comedy. A basic narrative structure is formed by the construction of the gag, a gag that is itself constructed on the basis of the deployment and redeployment of an apparatus. A man attempting to water his garden is prevented from doing so by a boy stepping on the hose. When the man examines the nozzle to see what is wrong with it, the boy steps off the hose so that water suddenly spurts in the man’s face. The man reprimands the boy and finally chases him out of frame with the hose. The narrative emerges from the apparatus mediating between the two characters and inscribing action with temporal development in the operation of the device (21). The gag, Gunning quite rightly suggests, emerges from the deployment of an apparatus which creates a detour of character action through an inanimate object, and of course from the man, initially oblivious to the boy’s intervention, being caught unawares. Gunning describes the anti-productivist ethos of mischief films like this. Their primary aim was the derailment or interruption of intentional action. Indeed, this quality of interruption or derailment and the fact that it was “structured around a quick payoff” constituted its gag-like structure and prevented the “flow…into a longer temporal progression” (22). As films increased in length, directors for a time strung pieces of mischief together in a kind of additive or parataxical structure, but ultimately this method proved unsustainable and the mischief film all but disappeared. 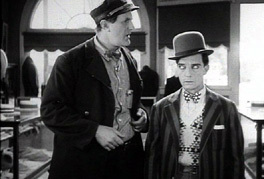 Gunning argues, however, that the operational aesthetic continued to prevail into the 20s in Chaplin’s assembly lines and Keaton’s locomotives: “This fascination with the way things come together, visualising cause and effect through the image of the machine, bridges the end of the nineteenth century and the beginning of the twentieth, shaping many aspects of popular culture” (23). The Keaton films in which the operational aesthetic most clearly comes to the fore can be called task films (although there is a task dimension in all of Keaton’s films) (24). The operational aesthetic is evident in the articulated gags in One Week orchestrated in relation to the construction and transportation of the house, the gallows with an elasticised noose and the machinic performances of the rioting prisoner and the Keaton character in Convict 13, the collapsible mast designed to allow the vessel to squeeze under the low bridges in The Boat, the trafficator made from a boxing glove and pantograph (extension scissors) in Cops, the constructive and destructive transformations of the house in Electric House, the demolition of the car and the invention of the sprung saddle in The Blacksmith, the hybrid balloon/boat in The Balloonatic and finally Buster’s lifeboat and his means of lowering it into the water in The Love Nest. The most memorable exploration of the operational aesthetic occurs in Keaton’s two-reeler The Scarecrow. The adaptation of objects and construction of apparatuses that structure so many of Keaton’s ventures are here used to add a masculine touch to domesticity. 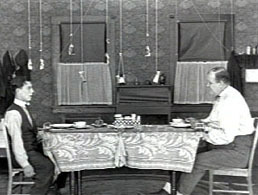 The film opens with two men (Keaton and Joe Roberts) at home, one with a toothache, the other with an idea of how to remove the offending tooth. After misconstructing an apparatus, but nevertheless succeeding in removing the tooth, the two men prepare for dinner. The house they share is completely, though somewhat unconventionally, mechanised. It is filled with transformable objects and apparatuses constructed to economise and masculinise domesticity. A phonograph is also a cooker, a table-top doubles as a wall plaque, a sink converts into a lounge, a bed into a piano. Strings and pulleys connect the bottles of condiments set on the dinner table so that they can be efficiently exchanged and conveniently removed. While the plates are attached permanently to the table, the table itself is detachable so that food can be emptied from it and fed to the pets outside through a trap door before being hosed down. Gunning’s identification of an operational aesthetic in early cinematic comedy unquestionably provides a means of understanding the deployment of apparatuses in both Keaton’s short and feature-length films. More importantly though, it can be used to explain how these apparatuses relate to Keaton’s gags and Keaton’s narrative structures. For the operation of apparatuses oft-times provides the substance of both the story and the comedy. Consider, for example, the two-reeler The Electric House. As a tale of retribution, narrative events are linked through misidentification and revenge. The Keaton character has just graduated as a doctor of botany but is mistaken for an electrical engineer and contracted to electrify a house. The film is organised around the undertaking of a single task. Both the story and the film’s comic dimension emerge from the demonstration of the uses of electricity. And both, literally and figuratively, are concerned with crossed wires. This film recalls the house of gadgets in The Scarecrow and one can imagine that the diverse uses of electricity that the film explores would have dazzled contemporary audiences more than today’s. (It is the poetic, often surreal, quality of the images that emerge from this enterprise that remains impressive.) Stairs become escalators; the bath travels to the bed to pick up its client; dinner is distributed by train; the plates are cleaned in the dishwasher and returned to their cupboards by conveyor belt; the pool table is electrified to set up the game; the library to distribute books; and outside, the water-level of the swimming pool can be altered by shifting a lever. The film’s gags involve both the operationality and malfunctioning of these newly invented machines. As one would expect in a Keaton comedy, a few slapstick glitches temper the demonstration of such modern marvels. The real engineer gets his own back by unleashing the destructive underside of electricification. The circuit room is like a computer, which he reprograms to turn the house against its inhabitants. Keaton’s attempt to carry his suitcase up the stairs turns into a Sisyphean nightmare. With the trunk heavy on his back, he is unable to see that his interminable movement up the stairs is thwarted by their downward mechanisation. And as the owner argues with one of his guests in the library, the automated book selector slaps the latter on the back with such perfect timing as to lead the man to believe his host is the perpetrator of the violent deed. Lights flash off and on of their own accord and the dining room furniture starts to pulsate. The rollaway bath seems to take offence at Keaton and the girl being alone together in the room and intervenes in the situation by sucking him in and ferrying him away while knocking her onto the bed, which in turn folds up and imprisons her in the wall cavity. The house that had been animated by electricity appears to those within it as suddenly animistic and, in this respect, it behaves in a manner not unlike the malevolent house in One Week. 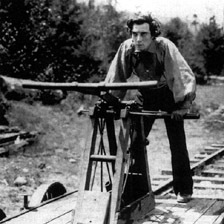 Undoubtedly the contraptions and apparatuses in Keaton’s films are the basis for his gags. Even if the operation of such machines does not always correspond with the Keaton character’s intention (for he is capable of unleashing in them an unstoppable destructive capacity), they are his primary means of adapting to the world in which he lives and they justify his continuing existence in the film. Related simply to tasks and the malfunctioning of apparatuses, the operational aesthetic appears to break out at isolated moments. The machines that Keaton constructs in his short films are mostly small gestures of intentionally directed behaviour that accumulate to form the plot. Occasionally the aesthetic is pursued quite rigorously, as in One Week or The Boat; but more often than not, its somewhat piecemeal form is closer to that of the turn of the century extended mischief films. In Keaton’s early work, the operational aesthetic coincides with the films’ status as farce comedies and its mode of functioning is no doubt a new means of accounting for the structure of farce. What is interesting is the way Keaton eventually manages to extend the form into some of his features as well. The operational aesthetic permitted Keaton to respond to the demand for longer films (and for greater adherence to the conventions of realism, characterisation and story) without abandoning what was essential to the comedy of his short films. Gunning, for his part, hesitates over aligning this aesthetic with narrative structure. While arguing for the coincidence of comedy and a fascination with operationality he nevertheless initially refuses to concede that the gag could be “an elementary building block of narrative” (25). Instead he holds to the gag’s predominantly disruptive role and anti-productivist basis – a role consonant with those gags I have just elaborated in The Electric House. But he nevertheless ends up considering the narrative component in such gags (26), coming to the conclusion that “in their contact with narrative, gags do not simply lose their independence, but precisely subvert the narrative itself” (27). This is achieved “not through their non-narrative excess, their detouring of narrative concerns into pure attraction [such as slapstick], but precisely through their integration with narrative, their adoption of narrative’s form of logical anticipation and their subversion of it” (28). While Gunning utilises the concept of the operational aesthetic to demonstrate that causality and mechanism coincide in the gag, and that this ordering produces something like narrative, his emphasis is ultimately on crazy machines, absurdist mechanics and hence the gag’s subversion of narrative’s anticipatory logic. The gag, in other words, relies on a cause-effect structure but follows recognisable causes with unexpected effects. The gag’s subversion of narrative remains part and parcel of an anti-productivist ethos. In addition, Gunning’s interest lies not in the story or what the event means but in how the operational aesthetic focuses upon the functions and processes of the machine. But while he identifies the coincidence of causality, mechanism and gag, he fails to reflect upon their configuration in functional (as opposed to absurd anti-productive) causality – precisely that kind of coincidence that we saw at the beginning of this essay in the series of gags that established the narrative of My Wife’s Relations. Such coincidences produce a mechanistic kind of narrative in which meaning is indeed secondary to operationality. In pursuit of the Northerners, Keaton prepares to use against them the curious bombarder-mortar-cannon he has had the foresight to hitch on to the back of his train. He loads the weapon with elegant pinches of cannon powder (first variation: cannon charge assimilated into salt-cellar). Keaton lights the weapon’s fuse. The cannon fodder pops out and, after describing a most graceful curve, drops a few feet away (second variation: simple turnabout, Keaton’s fiasco. The cannon belches its projectile in a niggardly fashion). But Keaton isn’t one to let himself be bested. This time he stuffs the cannon full to the brim. Now we’ll see what we’ll see. He lights the fuse and, while it burns, returns to his driver’s seat. But on his way back to the tender he unfortunately uncouples the mortar truck, detaching it from the rest of the train. The liberated connecting hook drags along the track, jerking the weapon and causing the cannon to lower dangerously, until it’s aiming directly at Keaton who tries to save himself. But in his panic he’s ensnared his foot in the hook of the tender, and remains a captive directly in the cannon’s line of fire. In a fit of panic he impotently throws a piece of wood at the cannon (a supreme detail this, adding to the gag’s perfection). This solution proving ineffective, he faces the cannon, helpless. Lebel reduces this “double-trigger” gag to the three moments of the dialectic. The first stage comprises Keaton overloading the cannon; the second stage (or antithesis) occurs when the cannon turns on him; and the third stage or synthesis comes about because the cannon nevertheless hits its initially intended target. Lebel thus delineates the gag in dialectical terms, identifying Keaton’s behaviour with dialectical sublation (the Aufhebung). 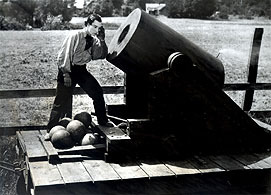 The sublative process is exemplified in his statement that both “Keaton and the cannon surpass themselves, the former by his magnified action, the latter, its function enriched by its added inventiveness and precision; Keaton makes the cannon do things it could never do otherwise” (31). Lebel’s interpretation is salutary in so far as it demands further examination of the relation between the machine, the comic and the dialectic. Unlike many other theorists of cinematic comedy, Lebel argues (in this respect like Gunning) that the gag is not necessarily an interpolation – an autonomous insertion into the narrative – which bears no necessary relation to the narrative chain but rather a necessary link in the narrative, a means of propelling the narrative forward. The frequency and the facility with which Keaton deploys this kind of comedy demands a consideration of the closeness of Keaton’s comedy to the operation of the dialectic and more specifically an examination of the means by which narrative is constructed in Keaton’s comedy. At the very least it begs the question of what kind of synthesis it is that resolves the contradiction. But how are we to account for the different positions of Lebel, who argues that Keaton is a dialectician, and Gunning, whose work implies that there is a tendency toward mechanism and mechanical causality in Keaton’s work? Let us turn to the concept of the dialectic itself and the distinction Hegel makes between internal dialectic and sophistry. For Hegel, an internal dialectic is the form of becoming of objective things and the “proper” form of becoming of concepts and categories. According to Hegel’s commentator Michael Inwood, the internal dialectic of objective things is internal to them in the sense that they “grow and perish” by virtue of their own contradictions. The internal dialectic of concepts is undertaken by the philosopher’s radical development of flaws within them, thus making them pass over into other concepts (32). Inwood claims that by virtue of the dialectic’s internal nature, the “dialectic is not a method, in the sense of a procedure that the thinker applies to his subject-matter, but the intrinsic structure and development of the subject-matter itself” (33). Dialectic purporting to be a method would be mere sophistry or an external application of the dialectic to concepts, “finding flaws in them that they do not really contain” (34). Comedies of misunderstanding, such as we see in Shakespeare, are doubtless sophistical in this sense. In theorising the relationship between the dialectic and comedic narrative, the concept of teleology can be used to distinguish between the dialectical or organic form of dramatic narrative and the possibility of a non-dialectical comedic form. Teleology doubtless has a relation to the dialectic in so far as both are modes of becoming, but teleology is not necessarily concerned with the resolution of immanent contradictions nor with sublation as the preservation of that which is negated on a higher level. Teleology for Hegel pertains to mechanism and chemism (35) and in contradistinction to the dialectic can properly be either internal or external. Internal teleology is exemplified in living organisms and has a stronger correspondence to the dialectic in so far as the realisation of purpose is immanent to the object (36). In external teleology, the purpose or goal is introduced from an outside agent rather than immanent. The agent thus presupposes the object and intervenes in it by attending to the mechanical or chemical principles according to which it operates. The purpose that the object serves is not its own but that of the agent and often also that of another entity such as God. Lebel’s characterisation of Keaton as a dialectian could thus be challenged on the grounds he confuses the dialectic with teleology. Keaton’s surpassing of himself (as Lebel puts it) is not after all the result of the development of internal contradictions, but the outcome of nature conforming to narrative necessity through divine intervention (a curve in the track positions Keaton outside the cannon’s line of fire), which in this instance means the intervention of Keaton the director, the metteur-en-scène who usurps the power of God. In Lebel’s example of Keaton’s “dialectical” gag structure, the character’s action and its consequences would be more appropriately understood as the enactment of an external teleology rather than the operation of the dialectic. While there is an undeniably teleological aspect to the gag, it is not strictly speaking internally dialectical. In order to clarify further what is at stake in this mode of narrative development that functions in accordance with the rules of external teleology, we can examine the ramifications of Deleuze’s classification of Keaton’s films in terms of the large form of the action-image – the form which he argues is properly an organic form in as much as it is self-generating and self-regulating. For Deleuze’s situation of Keaton’s work in the context of the organic form of the action-image provides a pertinent backdrop for a consideration of comedic narrative. Let us bear in mind too that dialectic, for Hegel at any rate, is necessarily organic and that the difference between internal dialectic and the external application of the dialectical method is ultimately a distinction between the organic and the inorganic. The action-image is the term Deleuze uses for Classical Hollywood narrative. His emphasis falls predominantly on the active, transformative structure of such films. Transformation occurs on the basis of two different compositions of images of actions and images of situations which give rise to the large and the small forms. In the large form the relation between situations and actions has the formula SAS’ (Situation, Action, new Situation). The small form, on the other hand, is expressed by the ASA’ structure. An action discloses a situation that demands a new action (37). The large and small forms of the action-image thus articulate specific economies of narrative. Deleuze in fact specifies five laws of the large form of the action-image, but does so quite separately from his discussion of Keaton. What is important to us here is the way Keaton’s comedy both deploys and modifies them. This will be demonstrated by posing Deleuze’s articulation of such laws against the narrative structure of Keaton’s feature films. In so doing, what Deleuze himself says is extended to show that Keaton’s comedy puts into question the organic quality that Deleuze attributes to the large form. In theorising the large form of the action-image, Deleuze specifies the sign value of images of situations in terms of the Peircian concept of the synsign. The synsign or the encompasser, as Deleuze also calls it, signifies a real or determinate milieu, a place with actual qualities and powers that specify that subject’s relation to the situation (38). The qualities and powers of the milieu impinge upon a character and make him/her respond to the situation in order to modify it. The fact that the situation impinges on the character in a particular way, and that the character is responsive, constitutes a second sign called the binomial. The binomial designates a duel made up of two individuated forces which intersect. One force comes from the synsign which can manifest itself in an antagonist, the other from the protagonist (39). The first law of the action-image pertains to the organic mode of the synsign, which forms a spiral of development and includes both spatial and temporal caesuras. This law of the organic structures the actualisation of milieux at the level of situation, space, frame and shot and organises the passage from the first situation to the subsequent one (S to S’) (40). Not only is it self-generating and self-regulating, it issues forth challenges that will be responded to and that will cause it to change. The second law concerns the passage from situation to action. Here the synsign/encompasser contracts into a binomial or a duel by means of the convergence of parallel montage. Lines of action emanate from the encompasser and converge in the binomial in order to “make possible the ultimate individual confrontation, the modifying reaction” (41). The third law refers to the actual point of confrontation. At the climax, montage, even the shot/reverse shot is forbidden. Rather, “two terms confront each other face to face and must be seized in an irreducible simultaneity” (42). The fourth law of the action-image is that the duel is neither single nor local; there is “a dovetailing of duels in each other. The binomial is polynomial” (43). The fifth and final law states that the breach between the encompasser – Deleuze also calls it the limit-image – and the hero is huge and “can only be bridged progressively” as the hero actualises his potential powers (44). Implied in this progression is the psychological development of the hero: “In general the hero must pass through moments of impotence, internal or external” (45). Insofar as the large form of the action-image is an organic form, it is synonymous with the Hegelian dialectic. It develops as a result of the emergence from the situation of internal, immanent contradictions which are resolved in accordance with their own immanent qualities. That is to say, the resolution of contradictions is organic. In order to see how these laws function in Keaton’s cinema we can consider the example of Steamboat Bill, Jr. The film’s narrative is centred around Willie (played by Keaton), a college dandy, attired in Oxford baggies, bow tie and beret, who visits the father he has not seen since early childhood. Steamboat Bill (Willie’s father) (Ernest Torrence) is a parody of early twentieth century working class masculinity. Big, beefy and butch, he embodies the ideal that to be a man entails practical competence and he is clearly repulsed by what he perceives to be his son’s effeminate qualities. The challenge presented to his son Willie (obviously so-named to accord with his personal affectations) is to prove his worthiness to his father. This challenge is for the most part ignored by Willie, who is more interested in pursuing the affection of a girl he knows from college than in pleasing his father. The challenge is only responded to when the storm hits and engages him in a duel of hyperbolic proportion (46). In Steamboat Bill, Jr., the synsign starts out as the idyllic quality of a town situated on the riverside of the Mississippi – which is immediately undermined by the place name “Muddy Waters”. Pastoral idyll has been wrenched open by the progress of modernity, the old steamboat is obsolete in the face of its modernised counterpart while the tradesman is superseded by the entrepreneur. The synsign thus contracts to form the two sides of the binomial: the Keaton character’s redundant father and the town’s most prominent businessman (King), come head to head on a number of occasions. What is distinctive in Keaton’s oeuvre, and this no doubt prevents his comedy degenerating into pure parody, is that he never breaks the third law, the law forbidding montage. The confrontation with the cyclone, like the collapsing bridge in The General, or the waterfall in Our Hospitality, is not conveyed through montage but is shot as continuous action. Steamboat Bill, Jr. in fact gives Keaton’s most famous example of the confrontation and the risk of death it involves. The facade of a two-storey building descends upon Keaton in a single shot, the open upper window becoming his escape hatch from a certain death. The fourth law is evident in the extension of the general antipathy between King and Bill, to Bill and Willie, and to Willie and his girlfriend’s father. Minor duels escalate into slightly larger ones: Willie is forbidden to see his girlfriend; Bill gives Willie a return ticket to Boston and sends him on his way; a violent outburst between Bill and King sees the former incarcerated, and so forth. In Steamboat Bill, Jr. the limit-image comes in the form of the cyclone. But while the Keaton character enters into a duel with the manifest dimensions of the cyclone and in so doing reinstalls harmonious relations, it is significant that he does not meet this challenge through self-transcendence as the fifth law demands. Admittedly, in Steamboat Bill, Jr. (and College), Keaton accumulates greater competency than in his other features. But this is far from convincing. Even though Willie rescues his father, and his girlfriend and her father, he still cannot tie a basic knot. There is thus one law of the large form of the action-image which Keaton’s cinema is not properly obedient to. In the Keaton character’s bridging of the breach presented by the synsign, he evidences little capacity for self-transcendence (47). So, we could say that in Keaton’s films the development of contradictions is organic, both the constitution of the synsign and the development of the binomial are organic but their resolution is inorganic. In spite of Deleuze’s claim that Keaton’s comedy complies with the large from of the action-image, it by no means complies with all the laws of that form. And in breaking the fifth law, Keaton throws into question the organic quality of narrative that the form claims. How, without self-transcendence, does Keaton meet the challenge presented to him by the limit-image? Deleuze’s emphasis on the machine and on the functions of recursion and minoration indicate the specificity of Keaton’s response. Minoration, or the conversion to the miniature, is the means by which Keaton diminishes the scale of his environment. To fully understand its implications it is first necessary to reflect further upon the fourth of the five laws. For the dispersal of the binomial in the polynomial gives rise to a number of minor difficulties. In fact, we can see here that the small form of the action-image (the ASA’) manifests itself in Keaton’s feature-length films. That Deleuze’s commentary on Keaton is not situated in the chapter on the large form of the action-image but in the one on the small form suggests that one should be wary about polarising the comedy of the small form and of the large form (polarising for instance, Chaplin and Keaton). Deleuze himself says in Chapter 11 “Figures, or the transformation of forms” that while “[t]he distinction between the two forms of actions is in itself clear and simple… its applications are more complicated” and that although directors have a preference for one form or the other, they also at times utilise the form that is not their usual one (48). My argument is that even though Deleuze proposes that the distinctiveness of Keaton’s comedy results from the audacity with which it tackles the large form, the small form is not only more prevalent in Keaton’s shorts but is evident in the large form in what Deleuze calls minoration. Let us turn for a moment then to the small form. Like the large form of the action-image, the small form is comprised of actions and situations, but in the latter variety the movement emanates from action to situation to new action. The small form, Deleuze writes, moves from “a mode of behaviour, or a ‘habitus’”, to a partially disclosed situation. … A representation like this is no longer global but local. … It is no longer structural but constructed around events [‘événementielle‘]” (49). The ASA’ form is comprised of a specific kind of sign, called the index, which provides the rationale for the images of actions and their disclosure of situations (50). The index itself is located in the action, whether it be a mode of behaviour, a gesture, a habitus, or a fully articulated action. There are two kinds of indexical actions: one refers us to something about the situation that is not present, to a lack or an absence of something; the other is equivocal or suggests two different situations at the same time. In cinematic comedy the latter kind of index prevails. Deleuze illustrates the index of equivocity in an example from a Chaplin film in which Charlie, seen from behind, appears to be sobbing convulsively until a subsequent shot discloses that he is shaking a cocktail. Certainly this is an apposite image of Chaplin’s use of equivocity to simultaneously produce pathos and comedy. My argument is that Keaton’s comedy also relies on the equivocity of the index. The equivocity associated with the small form dominates most of Keaton’s short films. For example, as the story of The High Sign develops the Keaton character participates in two antithetical modes of employment, while it becomes apparent that the trajectory of the narrative necessitates the removal of this equivocity. In One Week, lot 66 is confused with lot 99, and the further perpetration of equivocal signification by Keaton’s rival, Hank, changing the numbers on the house building kit, is the cause of the monstrous house and the debacle that results from having to relocate it. In many of Keaton’s shorts, but in some of his features as well, the narratives are propelled by a misinterpretation of signs, misinterpretation only made possible because of equivocity. In Convict 13 and The Haunted House the confusion occurs at the level of costume; in Cops, at the level of the object (the bomb which Keaton apprehends as a cigarette lighter), and likewise in The Balloonatic (the hybrid balloon-boat) and The Scarecrow (the contraptions/objects). The Playhouse is concerned with the equivocity of identity – Keaton not only plays the entire orchestra, but his girlfriend is a twin. In The Navigator, Rollo ends up on the wrong ship because a sign has only been partially disclosed to him, and in Battling Butler, the narrative is complicated by Keaton pretending to operate under the sign of someone he is not. This overwhelming evidence of the small form means it is not sufficient to look simply at the transformations of situations to grasp the comedic aesthetic of Keaton’s cinema. We must also examine the specific relationship between the large and small forms. For it is by grasping the nature of the interaction between these forms that we can understand the distinctive relationship between narrative and gag in his films. Deleuze, in fact, accounts for the transposition of the small form into the large form in Keaton’s cinema, proposing that Keaton’s originality lies in the way he “filled the large form [of the action-image] with a burlesque content”, indeed a content so at odds with the large form that Keaton’s reconciliation of the two is as implausible as it is improbable (51). While Deleuze himself does not say as much, the two forms intersect at the exact point that Deleuze attempts to theorise Keaton’s comedy in terms of minoration. Even though Deleuze proposes that various instances of the synsign in Keaton’s films are notable for their immensity and grandeur, he also argues that the hero of Keaton’s films deals with this immensity, these limit-images, through a process of minoration. The gap between synsign and character is filled by minoring actions. The notion of minoration is derived from the functioning of the machine. Deleuze writes of “Keaton’s dream of taking the biggest machine in the world and making it work with the tiniest elements” (52) and says of The Navigator “the machine is not merely the great liner by itself: it is the liner apprehended in a “minoring” function, in which each of its elements, designed for hundreds of people, comes to be adapted to a single destitute couple” (53). Minoration results from the Keaton character’s disavowal of what is essential to the constitution of the limit-image. Rather than the hero undergoing the self-transcendence necessary to rise up to meet the limit-image, he succeeds by diminishing its immensity. In diminishing it, he produces comedy. Despite Steamboat Bill, Jr.‘s indisputable presentation of the large form, it is not possible to begin to discuss it without mentioning minoration. Not only is there the diminution evident in the names of the three male protagonists, King, Bill and Willie, the dovetailing of duels that Deleuze discusses in regard to the fourth law must be understood in this film as the accumulation of minor duels. The passage from situation to action (the second law of the large form) similarly takes place through the accumulation of small details. In fact the antipathy between father and son is expressed in terms of costume and habitus (both of which are indicators of the small form). Keaton’s father, disaffected with his son’s appearance, takes steps to “redress” him. Willie’s whiskers are whisked away (“take that barnacle off his lip”, Bill senior instructs the barber) and new attire is sought for him. Bill senior attempts to alter the indices of his son’s personality so that father and son may be more harmoniously connected. The small form is also the means by which Bill hopes to recognise Willie when he meets him at the train station. Willie writes his father that he will be wearing a white carnation, but because it is Mother’s Day every man on the platform wears a white carnation. What should have been a sign of individuation becomes a sign of generality and sameness. When Willie and his father at last see eye to eye, it is notable that Willie has given up his pansy outfits for the work gear his father wanted him to wear from the start. And when King’s ship sinks at the end of the film, the crown is the only part which remains above water, King clinging to it with all his might. These points confirm that the small form (the minor) is present in what Deleuze otherwise calls the large form of the action-image. Actions express situations as much as situations give rise to specific actions. The concept of minoration can therefore be interpreted as implying that Keaton inserts the small form into the large form, that he uses the small form as the means of apprehending the situation expressed by the limit-image of the large form. The operation of minoration can in turn be understood as Keaton’s means of relating actions to situations – actions characterised by a refusal to acknowledge situations that border on sublimity, and, importantly, actions that respond to situations bit by bit instead. Keaton’s most overt minoration of the large form is found in The General, which diminishes the epic through the combination of melodrama and slapstick. The narrative of the heroic deeds undertaken by a Southern patriot in the American Civil War combines with the story of the patriot’s on-again off-again romance with his sweetheart Annabelle and monumental history is turned into the experience of a single couple (54). Two shots in the film illustrate this point. Johnnie has single-handedly taken on the group of thieves from the Northern army, chasing them by train. As his train advances north, a long shot captures him standing aloft the tender, facing the camera, chopping wood to fuel the boiler for his engine while the whole Southern army and then the Northern army pass behind him. The shot is funny not simply because Johnnie has his back to the action, not just because he is oblivious to the situation, and engaged in completing another action, fulfilling another function, but because of the disproportion, the disparity between the two planes of the image, the epic grandeur of the armies in the background, and the banal and docile demeanour of Johnnie chopping wood in the foreground. Here the two forms, the large and the small, meet in the single frame. Interestingly too, there is no dialectical point of confrontation, the two simply pass each other by. The second image exemplifying minoration occurs when Johnnie, having rescued his train and girl, returns to Marietta to warn the southern army of an impending invasion. As the Confederate General puts on his battle garb, Johnnie and Annabelle help him dress. Johnnie takes the General’s hat and puts it on his head. He straps his sword to his waist while Annabelle buttons his coat. The gestures of familiarity and domesticity similarly indicate the diminishment of the large into the small. Minoration comprises Keaton’s means of injecting the large form with components of the small form, but it also assists in the development of recursion series. The disconnection and equivocity of minoration combine with the recursion function. The operational aesthetic, in other words extends from the machine gag to the trajectory gag and thence to the narrative. The machine in The General is of course the train and the film ceremoniously and comically explores the spectrum of its operational capabilities. The train is derailed, diverted, has its cars uncoupled, is broken into, destroyed, conjoined, refueled, collided with, shown in forward and reverse motion. But it is also an adaptable machine; it can be used to destroy railway tracks and pull down telegraph wires. It is thereby transformed from a cumbersome vehicle lacking the velocity and manoeuvrability required to make a good chase element to an extension of Keaton’s own nimble body. …the narrative line of the film is also the spatial line of the film, the distance traveled; and both are none other than the actual railroad line itself. Its rails become a visual embodiment of a comic fatality controlling characters and events. Restricted to them, excluded from other directions and other possibilities of action, the northerners and Johnnie are held in conflict (55). While the editing of Keaton’s film might appear to conform to the conventional chase sequence, it is significant that there are no breaks in this trajectory. The first half of the film inscribes a line that moves from right to left (geographically from south to north and figuratively from good to evil); the second half is simply a reversal of this trajectory. Keaton’s dogged pursuit of the Yankees in the first half is matched by the Yankee’s determination to run him down in the second. The recursion function, we have seen, emerges whenever the Keaton character makes piecemeal attempts to further himself along a trajectory and it impacts upon the orientation of the action of the protagonist. Johnnie, for example, divested of his beloved train, pursues the thieves on foot. A handcart aids him and then, when it is derailed, he happens upon a penny-farthing that appears from nowhere (the very terrain of this shot is utterly discontinuous with the shots before and after it: a house is suddenly inserted between shots of a railway cutting). The penny-farthing is in turn upgraded to a train engine. While Johnnie certainly has a goal here, he is without a plan or a schema of how to achieve it. Rather than develop psychologically, Johnnie functions recursively. At best his actions have only tenuous relations to the end, but usually none at all. Values and events are linked not because of their direct relation to either the problem or its resolution but because they can be related to other values or events. Even in the absence of the machine, the operational aesthetic still structures the narrative through minoration and recursion. Recursion, for example, is apparent in the manner in which Keaton’s athleticism allows him to save the girl in College, in Willie’s confrontation with the cyclone in Steamboat Bill, Jr. where he is literally swept along from one encounter to the next, and in the montage sequence in Sherlock, Jr. Recursion and minoration are the alternative “mechanical” means to the logic of immanent causality of the dialectic. They are essential components of the structure of comedic narrative that Keaton brings to cinema. In Keaton’s cinema the recursion series doesn’t go on ad infinitum; but nor is it brought to an end organically. The organic force that conventionally structures narrative is replaced by the pure mechanical teleology of the trajectory. Through the combination of recursion and minoration, the trajectories and machines of Keaton’s films weave contiguous pathways until a solution is at last happened upon. Resolution is due to fortuitous circumstance and divine intervention. In this sense, the rendering of narrative form through the insertion of the recursive function suggests that Keaton’s contribution to the large form of the action-image, which Deleuze deems to be an expression of the American ethos, counters the very basis of its claim to organicism, and therefore naturalness. Deleuze attributes an ethical dimension to Keaton’s deployment of “the secret finality of the machine” suggesting that embedded in the strategy of minoration is the notion that the grandest schemas can still be made pertinent to the single individual. The Keaton character, like Rollo Treadway magnanimously trying to tow the ocean liner with a row-boat , persists as the little man, struggling with the elemental forces of the universe. Certainly, Keaton’s character’s stoicism illustrates an ethical determination to live by individual ideals and the recursion function provides a means of expressing this stoical character, but the comic formulation of this idea impacts upon the presentation of such an ethics. Far from degrading that character, as the comic is wont to do, the stoic ethic here takes on a sacred or beatific grace, but one that nevertheless permits the audience to distance themselves from its ethical dimension. From the machines and apparatuses for which Keaton is famous to Gunning’s operational aesthetic and Deleuze’s concepts of minoration and recursion, we thus see the logic that underpins the driving force of Keaton’s comedic aesthetic. In short, Keaton formulates a single logic for the narrative, the trajectory, the machine and the gag. The importance of Gunning’s work for our understanding of Keaton’s cinema is that he draws attention, perhaps for the first time, to the significance of the coincidence of narrative, gag and machine. In Deleuze’s work we find all the components necessary for a full and clear articulation of the operational aesthetic – the machine, recursion, minoration and the trajectory. The mechanical imitation of organic narrative that we see in Keaton’s work can doubtless be understood in terms of Henri Bergson’s conceptualisation of the comic as the “mécanisation de la vie” (56), but I would rather argue, along with Gunning, that the comic lays bare the mechanics of narrative ordering. Narrative is thereby made into a subset of the machine, simply one machine among many, and narrative meaning is reduced to little more than an effect of basic operationality. Thanks to Andrew Murphie, Lone Bertelsen, Lisabeth During and Richard Smith for their valuable comments on an earlier draft of this paper and Richard Smith and Roger Dawkins for the ongoing lessons on Deleuze’s cinema books. Gilles Deleuze, Cinéma 1: L’image-mouvement, Les Editions de Minuit, Paris, 1983. Gilles Deleuze, Cinéma 1: The Image Movement, trans. Hugh Tomlinson and Barbara Habberjam, University of Minnesota Press, Minneapolis, 1986. Deleuze, 1983; Cinema 2: The Time-Image, trans. Hugh Tomlinson and Robert Galeta, The Athlone Press, London, 1989. Steve Neale and Frank Krutnik, Popular Film and Television Comedy, Routledge, London, 1990. Tom Gunning, “Crazy Machines in the Garden of Forking Paths: Mischief Gags and the Origins of American Film Comedy”, Kristine Brunovska Karnick and Henry Jenkins (eds), Classical Hollywood Comedy, Routledge, New York, 1995, pp. 87–105. Buster Keaton, My Wonderful World of Slapstick, Da Capo Press, New York, 1982, pp. 173–4. From the time Keaton parted company with Roscoe “Fatty” Arbuckle in 1920 until he started to make features, he made 19 two-reeler films. Most of these were co-written and co-directed with Eddie Cline. Two (The Goat and The Blacksmith) were collaborations with Malcolm St Clair and the last, The Love Nest, was directed solely by Keaton. In the features Keaton shares the credits for directing with Cline, Jack Blystone, Clyde Bruckman, Donald Crisp, Charles F. Reisner, James W. Horne and Edward Sedgwick. Critics and commentators have generally acknowledged that the directorial responsibility for Keaton’s films was largely his (at least until he fell out with MGM), despite other directors being listed in the credits. Even Keaton’s gag writer and sometime co-director Bruckman said that Keaton “was his own best gagman” (Rudi Blesh, Keaton, The Macmillan Company, New York, 1966, p. 149) and that his crew were “overpaid from the strict creative point of view. Most of the direction was his” (Blesh, p. 150). David Bordwell, Narration in the Fiction Film, Madison, The University of Wisconsin Press, 1985; Neale and Krutnik; Donald Crafton, “Pie and Chase: Gag, Spectacle and Narrative in Slapstick Comedy,” Karnick and Jenkins, pp. 106–119; Gunning, “Crazy Machines” and “Response to Pie and Chase”, Karnick and Jenkins, pp. 120–122; Henry Jenkins, What Made Pistachio Nuts? Early Sound Comedy and the Vaudeville Aesthetic, Columbia University Press, New York, 1992. On this point see also Kevin W. Sweeney, “The Dream of Disruption: Melodrama and Gag Structure in Keaton’s Sherlock Jr.”, Wide Angle, vol. 13, no. 1, January 1991, pp. 104–120. David Bordwell, Janet Staiger and Kristin Thompson, The Classical Hollywood Cinema: Film Style and Mode of Production to 1960, Routledge, London, 1985. David Bordwell, “Happily Ever After, Part Two”, The Velvet Light Trap, no. 19, (1982), p. 2; Neale and Krutnik, p. 30. Gunning derives this concept from Neil Harris’ study of P.T Barnum’s entrepreneurial success, Humbug: The Art of P.T. Barnum, Little, Brown and Company, Boston, 1973. Barnum (1810–1891) was an entertainment entrepreneur, a wily pragmatist who would do almost anything to make a buck, including dramatising the reality effects of his shows, manipulating the truth and flagrantly deceiving his audiences. He achieved fame and fortune by blurring the distinction between the circus and museum, orchestrating such one-act attractions as the 161-year-old slave Joice Heth whom he advertised as having nursed George Washington. Harris develops the idea of an operational aesthetic to account for the attraction of the American public to such hoaxes. Barnum’s special contribution to Jacksonian America was to present conundrums and illusions to the American public who responded with a requisite amount of skeptical fascination. Barnum’s peculiar aesthetic sought to focus his audience’s attention on the “structures and operations” of his exhibits and hoaxes alike, all of which were “empirically testable, and enabled – or at least invited – audiences and participants to learn how they worked” (p. 57). The operational aesthetic then was “an approach to experience that equated beauty with information and technique, accepting guile because it was more complicated than candor” (p. 57). Significantly, Harris conceives this aesthetic more broadly than is suggested by Gunning’s application of the concept to the cinema, where it is taken as simply part of an endemic fascination with the machine and its illusory capabilities. Tom Gunning, “The Cinema of Attractions: Early Cinema, Its Spectator and the Avant-Garde”, Wide Angle, vol. 8, nos 3–4, 1986, pp. 63–70. Gunning, “Crazy Machines”, p. 88. Gunning, “Crazy Machines”, p. 98. The Lumière brothers’ film Charcuterie mécanique (the mechanical butcher) can be understood as an allegory for the cinematic process itself, a point taken up many years later by Jean Eustache in his 1970 film Le Cochon (co-directed with Jean-Michel Barjol). Gunning, “Crazy Machines”, p. 90. Gunning, “Crazy Machines”, p. 96. Gunning, “Crazy Machines”, p. 100. See Noel Carroll, An In-Depth Analysis of Buster Keaton’s The General, Ph. D. New York University, Xerox University Microfilms, 1976. Gunning, “Crazy Machines”, p. 95. He is of the view that cinema could only really produce dramatic narratives through the development of character psychology and the exploration of character motivation. For him, comedic narratives emerged only at that point that gags could be “intricately worked into comic personas”. p. 97. Jean-Patrick Lebel, Buster Keaton, trans. P.D. Stovin, A. Zwemmer Limited, London, 1967, pp. 124–7. Michael Inwood, A Hegel Dictionary, Blackwell Publishers, Oxford, 1992, p. 82. Mechanism is a device, means, machine or instrument. Inwood proposes that Hegel understands it in terms of an “arrangement and interaction of objects on mechanical principles” (Inwood, p. 181). Mechanism for Hegel is neither organic nor behavioural to the extent that “[t]he category of mechanism applies primarily to inorganic nature. But mechanism essentially consists not in the relations of physical or material bodies, but in external relations of persistent, independent objects”. (p. 181.) Chemismus or chemism refers to the arrangement and interaction of things in accordance with chemical principles. Inwood notes Hegel’s differentiation between chemism and mechanism: “[a]n object in a mechanistic system might in principle exist, … even if it were detached from the system and thus unrelated to other objects. But chemical substances or stuffs are intrinsically related by their opposition to and affinity for each other” (p. 182). Deleuze, 1983, pp. 141, 218. Indeed, in so far as cinematic melodrama has been theorised as exploring the problematic constitution of masculinity, the intrusion of the epic form (which conversely deploys an unproblematic representation of masculinity) explicitly addresses the representation of masculinity in melodrama. By creating an oxymoron – epic masculinity versus melodramatic masculinity – Keaton’s films make fun of both constructions. See Geoffrey Nowell-Smith, “Minnelli and Melodrama”, Christine Gledhill (ed. ), Home is Where the Heart Is: Studies in Melodrama and the Woman’s Film, British Film Institute, London, 1987, pp. 70–74. In addition to Lebel, many theorists of Keaton’s comedy make the mistake of presuming that the Keaton character surpasses himself because of the challenges he confronts. (See, for example, Noel Carroll and Daniel Moews, Keaton: The Silent Features Close Up, California University Press, Berkeley, 1977.) The issue of self-transcendence is a complicated one in the genre of comedian comedy because the narratives of such films are organised around the virtuoso performance abilities of already established live entertainment comedians, whether they be from vaudeville, the music hall, the night club or the television variety show. The central performer has an existing extra-diegetic persona that is grafted on to the identity of the character. Whether this persona is to be regarded as transcending the limitations of character identity is not altogether clear, but it is undoubtedly the case that the extra-diegetic persona gives the character license to behave in a manner that is inconsistent with the conventions of fictional realism. Theorists like Steve Seidman (Comedian Comedy: A Tradition in Hollywood Film, University of Michigan Press, Ann Arbor, 1981) and Peter Kramer (“Derailing the Honeymoon Express: Comicality and Narrative Closure in Buster Keaton’s The Blacksmith”, The Velvet Light Trap, no. 23, spring 1989, pp. 101–116) have argued that the narratives of comedian comedies develop in such a way as to create an opposition between the performative license of the comedian and the normative society of the diegesis. More precisely, they argue that the performative license is bound up with non-conformity, with aberrant and anti-social behaviour and that the purpose of narrative development in such films is to ensure the subordination of such excess. I have demonstrated elsewhere (“Fool’s Gold: Metamorphosis in Buster Keaton’s Sherlock, Jr.”, Lesley Stern and George Kouvaros [eds], Falling For You: Essays on Cinema and Performance, Power Publications, Sydney, 1999, pp. 209–244) that not all of the narratives in comedian comedy function in this way and I have argued that the tension between the extra-diegetic persona and the diegetic character puts the notion of identity and the possibility of transcendence into question. “L’originalité profonde de Buster Keaton, c’est d’avoir rempli la grande forme d’un contenu burlesque qu’elle semblait récuser, d’avoir réconcilié contre tout vraisemblance le burlesque et la grande forme” (Cinéma 1: L”image-mouvement, p. 237). Unfortunately in the wording of the English translation Deleuze’s reference to what is specifically comic is lost. The English translators, for instance, write that Keaton merely “gives” the large form a burlesque content and the multiple senses of the term tout vraisemblance are not evident in the English “against all odds”. The idiom is usually translated as “in all likelihood” or “in all probability” but the term vraisemblance also carries with it the meanings verisimilitude, likelihood, plausibility and probability. The latter two words are especially significant since their opposites, implausibility and improbability are often used to specify the nature of comedy. See for instance Jerry Palmer (The Logic of the Absurd: On Film and Television Comedy, British Film Institute, London, 1987) and Neale and Krutnik. The connotation of verisimilitude is also important given that Deleuze claims that the action-image constitutes the cinema of realism and that while the large form of the action-image is usually reserved for the great realist genres of the epic, the documentary and the Western, it is the small form of the action-image that is properly comedic. He proposes at the same time that it doesn’t necessarily give rise to comedy and can be used for dramatic effects as much as comic effects. George Wead has noted that the narrative is adapted from a real story in the American Civil War. In 1862 a union spy stole a passenger train at Big Shanty in Georgia. His plan was to travel to Chattanooga and destroy along the way the telegraph wires and track. The plan failed because the spy was pursued by the train’s engineer and a road-shop foreman. The spy and his accomplices were captured and hanged. George Wead, “The Great Locomotive Chase”, American Film, vol. 2, no. 9, July–August 1977. Henri Bergson, Laughter: An Essay on the Meaning of the Comic , trans. Cloudesley Brereton and Fred Rothwell, Green Integer, Copenhagen, 1999. Lisa Trahair is Senior Lecturer in Film Studies at the University of New South Wales. Her book Laughing Down Silence: Sense and Nonsense in Early Cinematic Comedy will be published in 2005.